Spring Hill Office: (352) 799-8000 Port Charlotte: (239) 671-8973 Don't Replace It, Re-Level It! 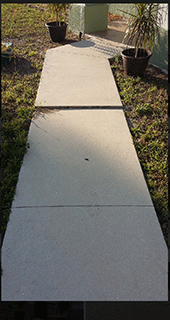 We received a call from homeowners who were concerned about a sidewalk that leads from their driveway to their front door. They began explaining how over time a few trip hazards had developed and were becoming quite a danger to delivery personnel and guests coming to their home. The homeowners explained how they always parked in the garage and entered through the garage door and never really used that sidewalk, so they never gave it much thought. It was not until a delivery person mentioned that they almost fell while carrying a fragile package to the front door. It became even more apparent they had a real issue when a friend came over for a visit. While walking up the sidewalk to the front door, the visitor, (an elderly woman), lost her footing as she tripped over the uneven sidewalk. Thankfully, she was uninjured and in good spirits and did not want to take further action. In many cases, homeowners are not so lucky. Liability, for avoidable trip hazards, falls on homeowners which can lead to lawsuits and legal recourse. 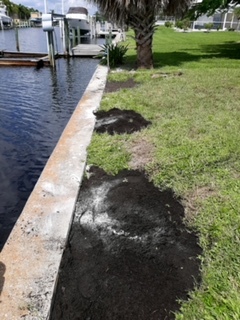 Realizing how lucky they were and how serious the situation could have been, they searched online for sidewalk repair Port Charlotte FL to find options other than concrete removal, since the concrete was not cracked and was visibly in good condition. They found Environmental Foam Solutions (EFS) online and learned how expanding polyurethane foam solves things of this nature. They looked through our gallery which also includes pictures of Seawall repair, pool deck repair, driveway repair, and trip hazard removal jobs that we have completed. Thinking that EFS could be what they were looking for, they found our online request estimate section and filled out the brief questionnaire which requests a name, telephone number, and a brief description of the problem(s) that need to be addressed. The next morning, we called the homeowners to talk about the problems they were experiencing. They explained how the trip hazard had grown and that they had someone trip over it recently and realized that it is an emergency that needs to be repaired. They asked a few questions such as, “Why is this happening? What can be done? 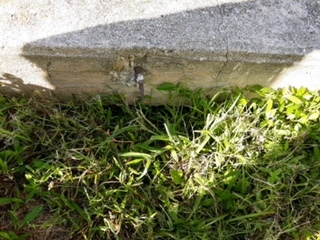 And how much is something like this going to cost?” After asking them a few questions about the layout of the sidewalk, gutter locations, angle and elevation of the property, we came to the conclusion that a gutter was undermining the soil that was holding the sidewalk in place. A concentrated amount of water was washing on and around the sections of that sidewalk and there was no soil to keep the sidewalk concrete supported. Understanding the basic nature of erosion, it was apparent to us that this could be helped by extending the gutter outlet. The options for the gutter outlet can be rerouted by extensions or in this case, an underground rain away system was thought best. A rain away system is an underground gutter extension that brings unwanted gutter runoff out to the desired location whether it is to the lawn, bushes, or spillway. The system leads water to these locations and will have a sprinkler like pop-up head that evenly spreads the excess water. Once we had the cause of the problem handled, we were able to move on to addressing the sidewalk. Removing the trip hazard is a simple process that involves injecting two-part expanding foam into the desired locations to achieve the best result. We do this by drilling small dime-sized holes into the affected areas. Placing the injection port into these holes allows the material to flow with no mess. Once the affected areas are prepped with the injection ports, the next step is to check the measurement of the differences in the sections of sidewalk. Using electronic levels and laser transoms we can monitor all movement caused by the expanding foam. With all of the levels and sites in place, we can lift each section to its correct height. As the expanding foam spreads through the loose soil it will fill any void, while compacting any areas where the gutter erosion was greatest. After the expanding foam has solidified the area, the only place for the foam to push, is up. Now the concrete will begin to lift into place. Then, all excess material will be cleaned and the small holes patched with concrete repair mix. After a site visit and going over everything with the property owners, they wanted to receive other bids as well, to get the best deal. I suggested the closest competitor and also a mason to get the best price comparison. After a short time, the property owners called us back and requested to be put on the calendar for installation. Always happy to help property owners with the best quality workmanship as well as the lowest price, we scheduled their installation for the following Thursday. Always calling ahead, we phoned the property owners to let them know we were in route and on time for our appointment. Upon arrival, we greeted the property owners and again went over the pin locations where we would be drilling, and how long we would be on site. With everyone on the same page, we unloaded our state-of-the-art Mobile Track rig and equipment. We set up our laser transom and laser monitors on the sections we did not want to lift, but still wanted to keep an eye on. We then drilled small holes into the desired locations of the affected areas. We put the electronic levels on the areas that we were lifting to monitor down to the tenth of an inch. After holes were drilled and injection ports were in place, the lifting began. (Working with expanding foam can be extremely fast, as it only takes minutes to cure). Having the lifting done within minutes, all sections of concrete were now even. All dangerous trip hazards were removed and we then cleaned and patched the small holes and put away our equipment. 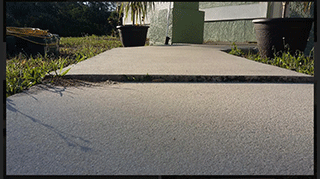 Considering that it takes freshly poured concrete weeks to cure, and it will not match existing sections, while our foam takes only a few minutes and is a fraction of the price, that is our kind of solution. So after an hour total on-site we had removed the trip hazard and stabilized the surrounding areas, cleaned up and loaded all equipment. The property owners were blown away by our process. They said it was like watching a science project. New technology can save time and money, and leave a cleaner final presentation. With a smile and handshake, we left the property owners feeling safe with the 5-year warranty EFS provides. Knowing they did not have to worry about the danger of someone hurting themselves tripping over their sidewalk was worth every penny to them. Cost can be the deciding factor in a lot of instances for homeowners. Whether it is a home or business, minor repairs can be the most overlooked. And in most cases, a few hundred dollars can in the end save thousands, not to mention prevent lawsuits and rising insurance rates. We give estimates based on materials used and the amount of labor. Being owner-operated gives us low overhead, which translates to lower prices to our customers. We have no minimum price for jobs and believe that no job is too small. Every trip hazard is a disaster waiting to happen and can be avoided for very little money compared to concrete replacement. As an owner operated company, we take pride in every job and treat it as if it were our own property. Giving homeowners a low price option in a big company market is what we take pride in. Every job will be done with impeccable detail since our owners sell and install every job performed by EFS. 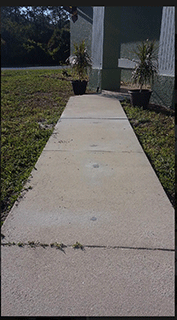 If you have a sidewalk in need of repair in Port Charlotte or surrounding areas, we cover most all of Southwest Florida and are here to discuss whether our services are a fit for your project. Call our local office at (239) 671-8973 or fill out the form on this page to get your free estimate. 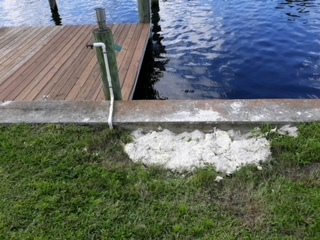 We received a call from a homeowner, who was really concerned about her Fort Myers seawall repair options. She briefly explained how it was eroding in certain places and causing depressions. Being extremely worried her seawall was going to become unsound and fail, we went over a basic overview of how that can be caused by rainfall rolling off and tidal erosion in the places where there are cracks leading to “venting” of water and sediment materials. This process is relentless, especially after years of severe rain and hurricane conditions. After she understood the causes of the erosion, she then asked how our process of using expanding foam could help. We explained how the benefits of using expanding foam in situations such as hers can be less expensive and have better results than older methods. Using expanding polyurethane foams allows us to seal any leak, fill voids and compact surrounding soils with low impact, fast acting materials. We then set up an appointment to come out and evaluate the project and then give an estimate. We met with the homeowner on her new lot where she would build her dream home. She explained how she and her husband shopped around for the perfect piece of land on the water to retire on. They looked at a few pieces of property and noticed the poor condition of many of the seawalls, which deterred them from purchasing many of the lots. The lot that they chose had a newer seawall (under five years old), and they began the long process of building their dream home. After the grass was cut and maintained they noticed a few depressions along the wall. At the time they did not think that the depressions were a big deal so they did not do anything to address them. However, over time these depressions developed into small voids that grew deeper after every rainstorm. Soon it became a danger to compromise the integrity of the seawall. They then became very concerned that they might have waited too long and let a perfectly good seawall become unsound. The homeowners did not want to have to replace the seawall completely, as a new one can cost tens of thousands of dollars. We explained how our process can save and stabilize the soil along the cracks and depressions, which could save the seawall. We inspected the density of the soils behind the seawall. Then, the depth and size of the voids were measured as well as the length of the wall to assess the damage and lay out a repair plan so that a bid could be formulated. 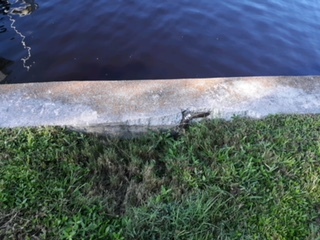 There were six open voids under the grass along the seawall, ranging in size from six inches to twenty-four inches in diameter. The six voids also measured from four to eight feet in depth. There were eleven depressions (which lead to voids) along the wall, ranging in size from ten to thirty-six inches in diameter. The density of the soil was extremely poor to the point that a hand probe could be pushed four to eight feet into the ground without resistance. Left untreated, these conditions could potentially lead to a catastrophic loss and a new seawall would be required. She thanked us for our time and explained she would receive another bid from a competitor. After one week had passed, she called us and said that our bid was the one they would proceed with. We thanked her and scheduled the job to be installed the following Tuesday at 8:30 a.m. . On that Tuesday morning, I called the property owner to wish her a good morning and to let her know we were in route. At EFS (Environmental Foam Solutions) the owners (who are also the salesmen and installers) are in direct contact with property owners at all times – from start to finish. Upon our arrival, we unloaded our state-of-the-art rig and equipment. We went over every step from how the rig works, to temperatures of the chemical, and all installation of the materials. We install our apparatus to all voids and depressions noting the “venting” locations along the water side of the seawall. While the injection locations are being set up, the chemicals are brought up to the proper temperature. When everything was set up and ready for installation, we asked the property owner to monitor the installation so that they are familiar and comfortable with the results of each injection location. Beginning on one side of the wall, we address the locations, monitoring the “vent location” and clean up any material that gets in the water. Even though our product is environmentally safe and the only product approved by the National Sanitation Foundation to come in contact with drinking water, it is still important to us at EFS to be clean and respectful to our waterways. After completion of each location, the grass and foam are trimmed and cleaned up respectively to a weight base and topsoil. As we move along the wall, we are filling voids and depressions, filling “venting locations,” sealing cracks, and adding density to surrounding soils. By doing these things we are able to solidify the seawall to regain lost integrity. Doing this also adds many years of life to your seawall, which retains the value of the property. Now that all injection points have been filled with the expanding foam and cleaned and prepared for base and topsoil, we can load up our rig and tools. All loose foam and pins are now cleaned up and loaded. We can now begin to add base to remove the depressions at grass level. First, we add a base layer consisting of natural raw material such as sand, gravel, or lime rock. After we have everything evenly spread and compacted, we then add a layer of compost topsoil to aid in the regrowth of the grass, which will in turn hold the soil in place. Now that we have the top soil in place the job is ready for the property owner’s final approval. She was extremely impressed by the outcome and the overall process, especially since she was unaware that this was even available. She thanked us and praised our work, which means everything to us. With this installation, the property owner received a five year warranty which covers any return visits at absolutely no cost. At EFS, we stand by our work, expertise, and the quality of our product. After payment and a handshake the property owner’s mind was at ease knowing that they could continue with the construction of their dream home since their seawall was now fixed. We were extremely proud to see a stellar review on Yahoo and Google for our hard work and great job. Outcomes like this are what we live for, taking pride in every project, and seeking to make the property owners happy. This is why an owner will be there to give a free estimate for all installations. We guarantee that every installation is done right, so we do it ourselves. As a result, we do not have the overhead of big companies, which means lower prices for our customers. 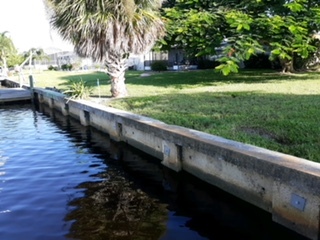 If you are in need of a Fort Myers seawall repair company, we cover most all of Southwest Florida and are here to discuss whether our services are a fit for your project. Call our local office at (239) 671-8973 or fill out the form on this page to get your free estimate. 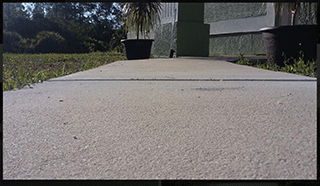 Over 30 years of Concrete Lifting and Leveling Experience! !